BOSTON, Nov. 8, 2013 – Michael C. Mah, one of the leading thinkers on the Agile development scene today, will lead two revealing sessions at the combined Better Software Conference and Agile Development Conference in Boston, Nov. 11-13.
WHO: Michael C. Mah, Managing Partner, QSM Associates and director of the Benchmarking Practice at the Cutter Consortium, a U.S.-based IT think-tank. Tutorial, Nov. 11, 8:30am: This world-renowned tutorial was over-subscribed at the recent Better Software Conference in Las Vegas. How to compare the productivity and quality that Agile developers achieve with that of traditional waterfall projects; learn about both Agile and waterfall metrics and how these metrics behave in real projects; attendees will also learn how to use their own data to move from sketches on a whiteboard to create Agile project trends on productivity, time-to-market, and defect rates. Using recent, real-world case studies, Michael Mah offers a practical, expert view of agile measurement, showing these metrics in action on retrospectives and release estimation and planning. As agile practices become mainstream, compelling patterns are being revealed about defect rates, time-to-market, and effort/staffing. Industry data from QSM Associates reveals that many companies grapple with collocation, pair programming, offshoring, and combining agile with waterfall methods. Some of the best teams find significant schedule and quality implications that are literally redefining the economics of software; others are not. What factors make a meaningful difference? With the latest industry analysis, Michael Mah discusses productivity, time-to-market, quality, and cost patterns as Agile communities mature. Serving as a comparison framework is the QSM SLIM industry database, with more than 12,000 completed projects—waterfall, Agile, offshore, onshore—collected worldwide. Attendees will learn find out how to assess their own patterns and apply the findings to their development practices. 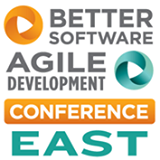 ABOUT THE CONFERENCE: The Agile Development Conference East and the Better Software Conference East are sponsored by Software Quality Engineering, which delivers training, support, research, and publications to software managers, developers, test professionals, and quality engineers worldwide. Since 1986, SQE has been at the forefront of software quality improvement technology and was instrumental in setting the stage for the software industry to view testing as a distinct discipline. Today, Software Quality Engineering is a resource relied upon by the Fortune 1000 companies. They also produce highly-rated publications such as Better Software magazine, StickyMinds.com, and TechWell.com. The conferences cover the latest in methods, technologies, tools, and leadership principles from thought leaders who deliver inspiring keynotes, in-depth tutorials, and a wide range of conference classes, with more than 100 learning and networking opportunities: Conference details and registration information can be found at http://bsceast.techwell.com/conference-overview-4. ABOUT THE SPEAKER: With 25 years of industry experience Michael Mah (Twitter: @MichaelCMah) teaches, writes, and consults for QSM Associates to tech companies on measuring and estimating software projects for offshore, waterfall, and agile. Michael and his QSM partners have researched thousands of projects worldwide. His work examines time-pressure dynamics of teams and their contribution to project success and failure. Michael’s clients include Boeing, Progressive, Verizon Wireless, Nationwide, JPMorgan Chase, Roche, and other Fortune 100 companies. He is the director of the Benchmarking Practice at the Cutter Consortium in the U.S.
ABOUT QSM ASSOCIATES: QSM Associates, Inc. helps organizations measure, plan, estimate and control software projects. It offers the SLIM (Software Lifecycle Management) Suite of tools, so managers can benchmark and forecast Agile, waterfall, in-house, offshore/multi-shore or ERP/package implementation projects. SLIM contains statistics from a worldwide database of more than 12,000 completed projects, enabling productivity benchmarking on the desktop. Using SLIM to dynamically run “virtual project simulations,” companies can model and forecast waterfall and Agile releases to deliver on time, within budget with >90% estimation accuracy. SLIM can also derive ROI achieved by Agile methods and other process improvements. QSM Associates offers consulting, training, and coaching to help accelerate this capability. Information is available at www.QSMA.com or email info@qsma.com. Along with Microsoft, Oracle, and Salesforce.com, QSMA is a Rally Software Strategic Partner.